Kitty Goes to War is book 8 in Carrie Vaughn’s smart and entertaining Kitty Norville series. A few months have passed since the events in Kitty’s House of Horrors. Kitty still has nightmares about what happened there, but she is easing back into her life. And Cormac is back in play, forging a new life for himself as a parolee. In Kitty’s latest radio show, she opens the phone lines for her callers to talk about the “Speedy Mart” convenience stores and odd happenings that are going on there. (I have to admit, the premise made me smile as one of Kitty’s early books featured what she thought was a wacked out caller ranting about Speedy Marts being built on ley lines.) Just a few days later, she is sued by the chain’s owner for libel. It’s not all that strange until the man shows up in person, offering to drop the suit if Kitty issues an on-air apology. The whole thing smells wrong to Kitty, so she asks Cormac to do some research on the man and on strange phenomenon at the convenience stores. 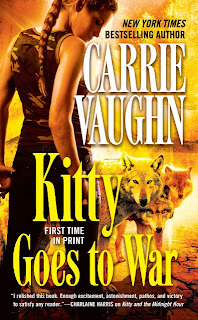 In the meantime, Kitty gets a call from the feds, asking for her help to deal with three werewolf soldiers who have lost touch with their humanity. Kitty makes it her mission to help the men. But it doesn’t look like all of them can be saved. The military angle is an interesting one. But I have to admit, much of my attention was on Cormac. He came back from prison “different.” And I can’t say I was very excited once I heard the reason why. I hope that gets resolved away at some point. In reading this, I took some time to figure out why I can’t let go of the idea of something between Cormac and Kitty. It’s because in every book, the author reminds us of the spark between them. She reminds us of what almost was. The path not taken. I wonder if I could just accept Ben if we didn’t get those reminders about Cormac in every book. And the reminder that he wants Kitty too. It’s maddening, especially as we get closer and closer to the end of the series. Because I feel jerked around by it. Despite my Cormac rant, I enjoyed the book. As always, I love Kitty and can’t wait to see what happens next. 4 stars.